On this page I will highlight some of my upcoming/current photography events. a program for new digital camera owners, at the Oak Park Public Library. This 1.5 hour program drew about 100 people. A special thank you to the Oak Park Public Library Public Information Officer, Debby Prieser for great assistance getting the word out. November 29, 2006: In mid October I took a photographic to some of my favorite areas of the Great American Southwest Landscape. In Death Valley National Park I ventured to the very remote area of Devil’s Racetrack Playa to view and photograph the mysterious “moving rocks”. This very special place has university geologists mystified. Boulders are known to “travel” over the perfectly flat Playa by unknown forces. Some of these rocks weigh as much as a half-ton. Google “moving rocks Death Valley” for background. I also spent some time photographing the fantastic Joshua Tree National Park. I was blessed with glorious sunrise light. Photographs from from this October 2006 trip will soon appear on my commercial site, www.stevegadomski.com on the DesertDetours page. November 29, 2006: My new line of posters is now available at Frame Warehouse in Oak Park, Illinois. www.FWChicago.com is the Frame Warehouse on-line site. The Frame Warehouse is stocking both the new Chicago landscape and the Great American Southwest Landscape lines. The posters may also be viewed inside the stores. November 29, 2006: My new poster line is now available at the Rush University Medical Center bookstore/gift shop. The downtown location makes this an ideal outlet for my work. Patients and visitors from around the world have viewed my night time images of the Chicago landscape. September 28, 2006: I have launched a new commercial site. 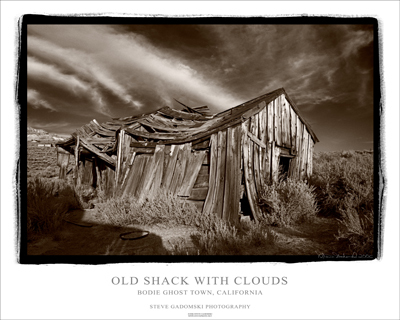 www.stevegadomski.com Posters featuring my fine art landscape photography are now available with secure PayPal shopping cart technology. Please visit today! To purchase original signed matted/framed prints, please email me at steve@stevephoto.net. April 4, 2006: This week Triton College in River Grove, Illinois announced the winning entries for it's 25th annual Salute To The Arts: Poetry and Graphics Competion. I am pleased to all have 3 photographs I entered be judged as winning entries. My selected entries were: Delicate Arch with Star Trails, Emerald Pools Falls and Monument Valley Spire. All of these award winning photographs are available for purchase at my commercial print gallery at Art.com. This contest had hundreds of entries from around the world. Entries were even received from Pakistan and Sri Lanka! My sister Nina Gadomski also had a winning poem in the contest! Information on Nina's new midwest United States travel book, Great Midwest Country Escapes can be viewed and purchased here using the Amazon.com link provided (which helps support this site). March 30, 2006: I am pleased to announce the availability of my landscape photography in J'Marc Gallery in Lake Geneva Wisconsin. J'Marc Gallery has been in this upscale southern Wisconsin resort town for over twenty years. It is located in the main business district at 736 Main Street, Lake Geneva, Wisconsin. The phone is 1(800)433-2443. Please stop by J'Marc Gallery when in Lake Geneva. They also ship purchases anywhere. J'Marc Gallery is carrying my new poster line as well as fine art edition images of the Chicago landscape. They do not have a web site. November 7, 2005: Come to the Oak Park Public Library for a free presentation I will be giving on landscape photography. This talk will be in support of the November show listed immediately below. This event will occur in the Veteran's Room at 7 p.m. I will discuss landscape photography composition and lighting. This will be followed by a digital projection demonstration of my Photoshop workflow techniques. November 2005: Solo fine art show of my black & white landscape photographs at Frame Warehouse in Oak Park, Illinois. Opening wine and cheese reception will be on November 4, 7-9 pm (Friday!!) . This show will feature 32 recent digitally reworked prints Most of the prints are from original medium format black & white negatives shot in the mid 1990's. Four of the prints will be from more recent digital captures. Three large scale framed prints will also be shown. All images will be available for purchase. The show runs November 4(2005) - January 4 (2006). The Frame Warehouse is located at 346 Harrison St., Oak Park, Illinois. Come on Out! Some of the show prints may be viewed here. September 28, 2005: I will be speaking about outdoor landscape photography at the Niles, Illinois REI outdoor sporting equipment supply store. This event will begin at 7 p.m. It should last about an hour. I will be selling and signing my new special edition landscape posters following the talk. These archival posters will be available for $20.00 each (unframed). Come on out! July & August 2005: Group photography show at Oak Park, IL. Village Hall. My print contribution is a black & white sand dune scene photographed in 1995 in Death Valley National Park. August 2005: Group photography show Oak Park, IL. Public LIbrary in the 2nd floor Art Gallery. I will have 2 images in this show. Both are color sunset views of the Chicago skyline. Chicago Sunset By Boat is a view from my friend's boat, about 4 miles out in Lake Michigan. This spectacular sunset image was photographed Labor Day 2004. Chicago Nightlight is an evening view from the top floor of a parking structure on the west side of Chicago. This special image was created from a composite of 8 long exposure digital images. Photographed February 2005. November 13th 2004: I will be heading out to Santa Fe, New Mexico to study with digital master photographer John Paul Caponigro for a full, intense week. After the Santa Fe Workshop I will spend some time photographing in Monument Valley, Arches and Canyonlands national parks. Monday August 23, 2004: At 7:00 pm I will be leading a gallery walk for the Oak Park Photography Club. The club has an August exhibit at the Oak Park public library featuring recent photographs by Club members. I will be offering comment, critique and encouraging discussion. June 14th 2004 -I will be giving a 30 minute talk on select images from this site at the Oak Park Public Library, Oak Park, Illinois. The talk is being hosted by the Oak Park Camera Club (OPCC). It will occur in the Veterans room on the second floor. The OPCC, founded January 2004, hopes that new members will attend. Please attend this special event. I currently am part of a group photography fine art show in Bloomingdale, Illinois. This juried exhibit features the work of College of DuPage intructors and former students. This exhibit is entitled Still Looking. I have chosen to include 2-16"x20" prints from my collection of Bodie Ghost town images. The exhibit will close June 26th 2004. Please stop in. Click for Museum link and further information about the Bloomingdale exhibit.